The Oppo R17 Pro has been launched in India at a price of Rs 45,999. The smartphone will compete with the Samsung Galaxy A9, which is the world’s first smartphone that has quad rear camera setup. The Oppo R17 Pro has been launched in India and its highlights are triple camera setup and in-display fingerprint sensor. On the other hand, we have the Samsung Galaxy A9, which is the world’s first smartphone that has quad rear camera setup. These two latest premium mid-range devices have a lot to offer but which one is the best when it comes to hardware? Let’s find out. The Oppo R17 Pro sports a 6.4-inch full HD+ display, which has an aspect ratio of 19:9 and a screen-to-body ratio of 91.5%. The smartphone comes with a tear-drop notch on top of it, which houses the front-facing camera. It has an in-display fingerprint sensor as well. The device display is protected by Corning Gorilla Glass 6. The Samsung Galaxy A9 sports a slightly smaller 6.2-inch SUPER AMOLED Infinity display that offers a resolution of 1080 x 2220 pixels. The phone does not have a notch on top like most of the other latest smartphones in the market. The physical fingerprint sensor is placed on the top at the back. The Oppo R17 Pro features a triple camera set up at the back, which is one of the main highlights of this smartphone. It has a 12MP primary sensor, 20MP secondary sensor and a TOF sensor at the back, which is a 3D imaging technology that can be used for mapping object. At the front, the device has a 25MP front shooter. The Samsung Galaxy A9 is the world’s first smartphone with a quad rear camera setup. It has 24MP primary camera, 8MP wide-angle camera, 5MP depth-sensing camera, and 10MP telephoto camera. The smartphone features a 20MP unit on the front as well. 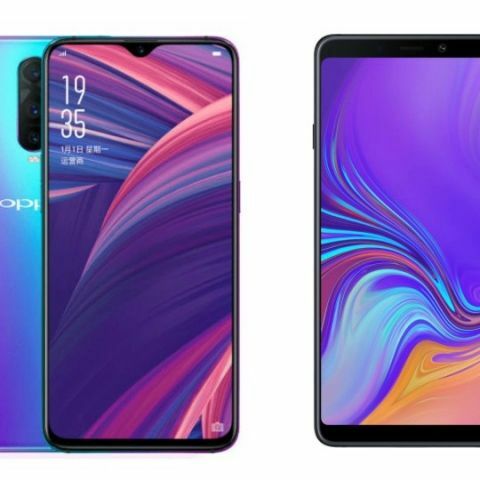 The Oppo R17 Pro is the first smartphone that comes with a Qualcomm Snapdragon 710 processor, which is paired with 8GB RAM and 128GB storage that is not expandable. On the other hand, the Samsung sticked with the old 6000 series as its latest Samsung Galaxy A9 is powered by a Qualcomm Snapdragon 660 processor. The phone packs 6GB RAM and 128GB storage, which is expandable via a microSD card to up to 512GB. The Oppo R17 Pro packs a 3,700mAH battery that supports fast charging. It comes with the company’s Super Vooc fast charging technology that can charge the smartphone to up to 40% within 10 minutes of charging.